UPDATE 5:06pm: GYMPIE Regional Council has announced plans to replace the Greens Creek bridge by 2019 after a woman was forced to swerve off the bridge to avoid an oncoming vehicle on Monday. Lynette Tompkins was forced to swerve to the left of the bridge when another vehicle rounded the blind corner from the opposite direction, taking up both lanes. 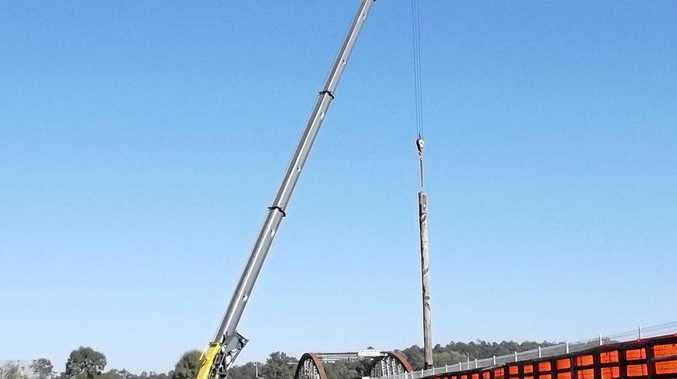 "Council has recently received approval for a state government funding contribution under the Transport Infrastructure Development Scheme to replace the bridge in 2018/19," a Gympie Regional Council spokesperson said. The bridge is expected to cost $1.5 million, with council required to supply half the funds. "In 2014 Council's engineers carried out a full investigation of this bridge," the spokesperson said. "As a result, earthworks were carried out to improve sight distance on southern side of the bridge and additional guideposts were installed to highlight the curve on that approach. "Narrow bridge warning signs with 60km/hr advisory speed signs are in place either side of the bridge." A double barrier centreline was installed on the bridge in December 2015. EARLIER: A CEDAR Pocket woman has expressed her anger after a driver allegedly fled the scene after forcing her off the Greens Creek bridge on Monday, resulting in a serious crash. It was the third crash in just three days where a Gympie region driver has failed to stop. Lynette Tompkins was driving northwest on Cedar Pocket Rd about 8.30am when she approached the Greens Creek bridge. "A four-wheel drive came around the corner, and it was on my side of the road, all but his passenger-side wheels," Mrs Tompkins said. "I put my foot on the brake and swerved to avoid him, and I've ended up going off the bridge, and he didn't stop." She was trapped briefly in her vehicle, a Holden Statesman, and couldn't be seen from the road. "I could hear people going over the bridge and not stopping," she said. Mrs Tompkins said she was angry the four-wheel drive, which she described as a white single-cab vehicle and possibly a Landcruiser, failed to stop after allegedly causing the crash. "What if I couldn't get out? What if nobody saw me? What if I was badly injured? I could have died there," she said. Her own neighbour finally discovered the wreck after driving over the bridge. "My next-door neighbour saw glass on the bridge and some smoke, so he's done a U-turn and come back, and by then I've managed to get out of the vehicle." Mrs Tompkins said she was incredibly grateful the neighbour stopped to investigate. "I've driven over it with hubby the next day, and where my car was, unless you were in a higher vehicle, you'd never have seen it. She said she'd already had several close calls on the bridge, which is on a 100kmh stretch. "That happens a lot on that bridge because there's a blind corner coming onto it, and it's a narrow bridge, even though it's two lanes," she said. "People don't think they can fit, but you can fit two cars on there easily." Mrs Tompkins sustained a concussion, bruised sternum, a dislocated thumb and a fractured arm. She will be unable to return to her job as an assistant nurse for at least six weeks, longer if the fracture requires surgery. Driver allegedly overtakes another vehicle on Mary Valley Highway last Saturday afternoon, forcing a driver to swerve into a tree. Gympie truck driver in court after allegedly hitting a van near Rockhampton on Sunday. The van then crashed into a tree, killing one man and leaving another with serious injuries.